In the picturesque Macedon Ranges is Rooks Edge, an 84-acre property offering a contemporary upmarket Bed & Breakfast for couples or groups. 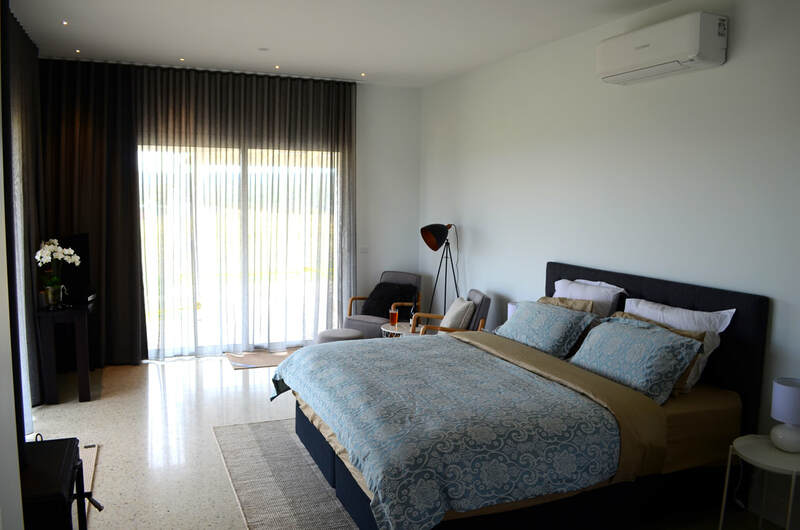 Ten minutes from Gisborne (40 minutes from Melbourne airport), the deluxe rooms are designed to take in the sensational mountain views and glorious sunsets. Focusing on peace and privacy, the rooms are perfect for a luxury getaway. Alternately, with twin room configuration this makes the perfect location for groups who hike, cycle, bird watch or crafters. Paddocks are available with horses welcome. Rooks Edge is located at the edge of Bullengarook, overlooking Lerderderg and Wombat State Park with open views to the Brisbane Ranges, the You Yangs and Corio Bay. This is the perfect central site for you within 10-30 minutes drive of 16 wineries, Hanging Rock, Kyneton Hatted restaurants, Gisborne restaurants and cafes, weekly farmers markets, artisan crafts, galleries or hiking and mountain bike riding. A registered sheep stud, come and stay overnight, the weekend or week. The open spaces, cosy fires, wool shop and local artisan crafts, inquisitive sheep and native Australian animals will make your stay one to remember. ​Rooms are named after our stud sheep personalities, we know, but wait until you meet them. Room can be changed to twin for groups. Both rooms are private king size rooms with contemporary shower ensuites. With their own wood fire, the rooms overlook the farm and offers sensational mountain views. Perfect for guests seeking the finest quality Macedon Ranges accommodation. Rooms can be changed to twin (shown) for groups. ​​​Coming from the airport or going to an event and do not want to drive? See the list of transport options available.